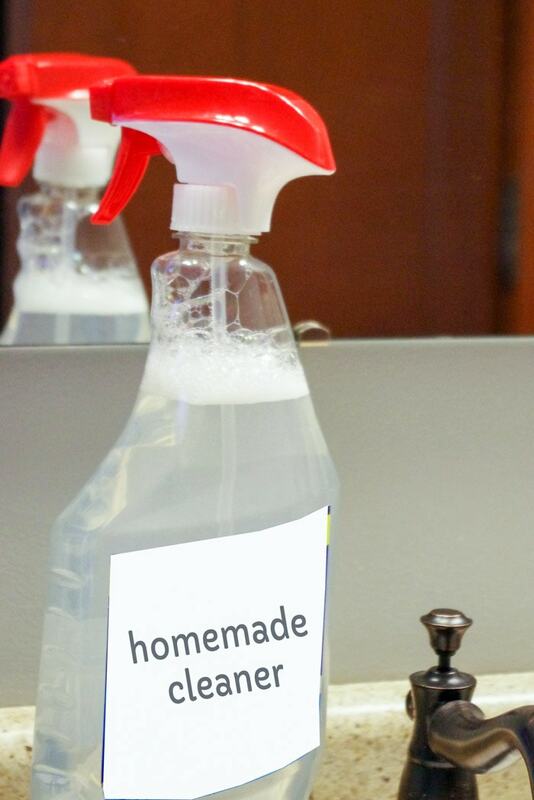 Make your own homemade glass cleaner with ammonia and get the best clean on your mirrors, showers and windows. 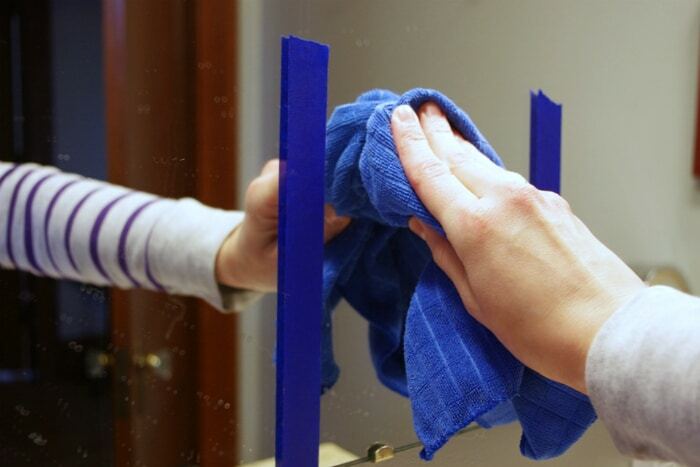 This homemade windex is awesome. 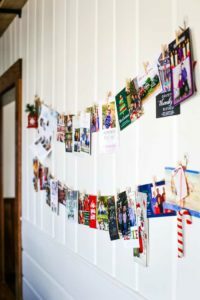 With spring cleaning season around the corner, there are loads of homemade, green cleaning solutions in blogosphere. 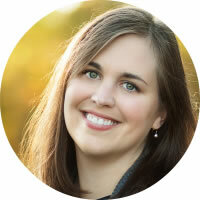 Recipes using distilled vinegar, essentials oils or squeezed lemons are all the rage. But when it comes to window and glass cleaner, I have not found a natural homemade alternative that does a better job than Original Windex. Sorry, but that’s the truth. Windex is king and “if it ain’t broken, don’t fix it” right? However….I’m not a fan of the cost of Windex -$3-$5/bottle – much of which is water! 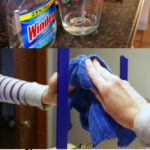 So today, I’m going to show you how to duplicate the recipe for Original Windex window and glass cleaner for less than a buck. It’s fast, it’s easy and just like Windex (minus the electric blue), in my opinion, it’s the BEST. Keep in mind that this is not a green recipe. Windex is not green and it never claims to be. I’m ok with this because there are many other cleaning products I use that are biodegradable or non-toxic for the environment. I even use cloth diapers! 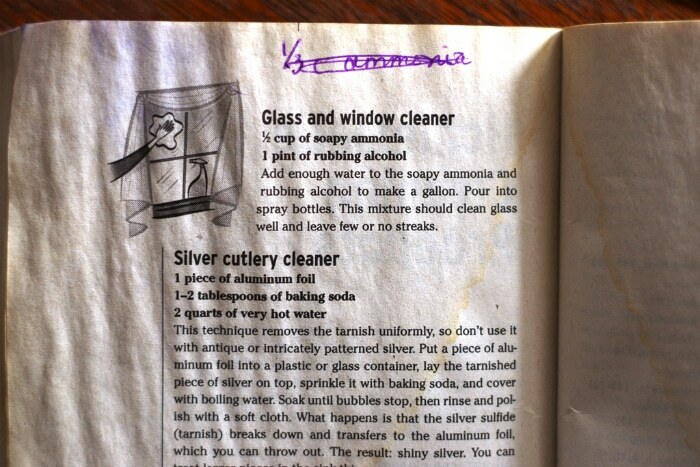 So… I’m not losing sleep over the 2 tsp of ammonia used in this recipe. Pick your battles, I say. Especially when it comes to efficiency and quality! Ok! Off the soapbox! Let’s learn how to make glass cleaner! 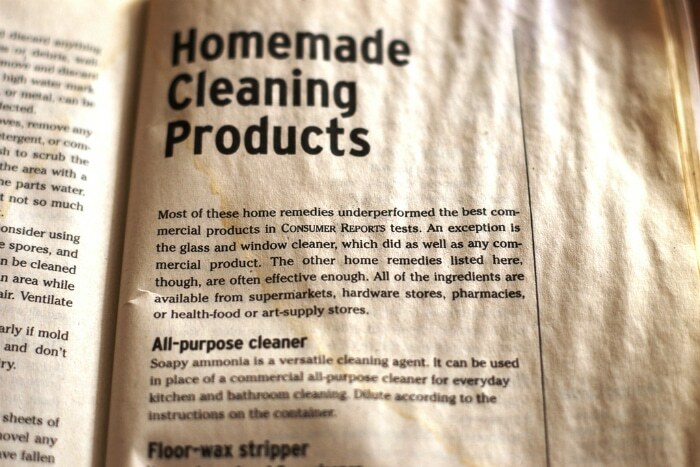 The recipe I am using comes from a 2002 Consumer Reports booklet entitled “How to Clean Practically Anything.” Their scientists tested many formulas and recipes and found that few homemade cleaning solutions performed as well as the store bought brands with the exception of window and glass cleaner. Homemade recipes mocking the big “W” brand did just as well. This will make a bit more than 1/8 cup, but I’m trying to keep things simple. None of us want to remember half measurements! Now that we have our recipe, let’s gather the supplies! 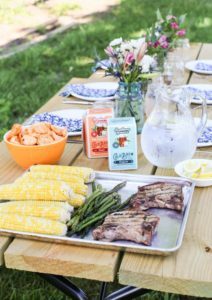 Here is what you’ll need: ammonia, rubbing alcohol, water, dish soap, measuring cups/spoons, basic funnel and a 26-32 oz. empty spray bottle. 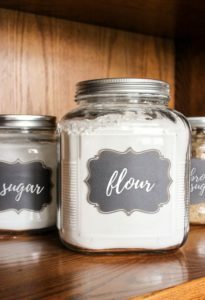 Trust me, it will take you more time to gather these supplies and set them on your counter than it does to actually make it! Start by making your soapy ammonia. Pour 5 teaspoons of water into a liquid measuring cup. Then add 2 teaspoons ammonia to the water. Treat ammonia like you would bleach. Its strong smelling, but if you aren’t going to touch it, there is no reason to wear gloves. Remember to replace the cap once you have poured your 2 teaspoons to prevent spilling. 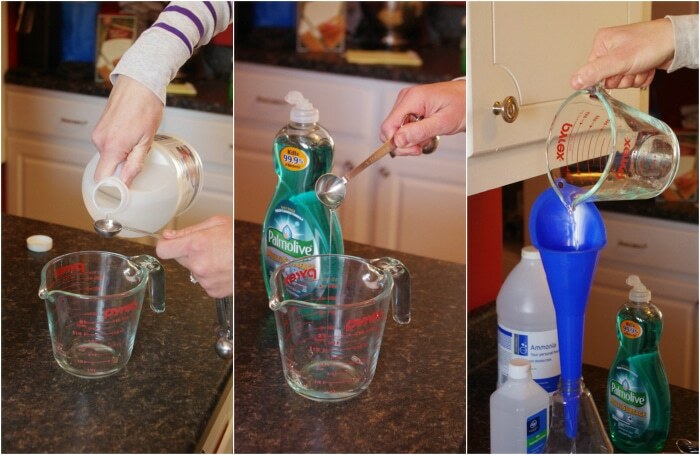 Now add 1 teaspoon of your favorite dish soap on top of the water and ammonia. Here I am using Palmolive Multi Surface, but any that you have by your kitchen sink will do! 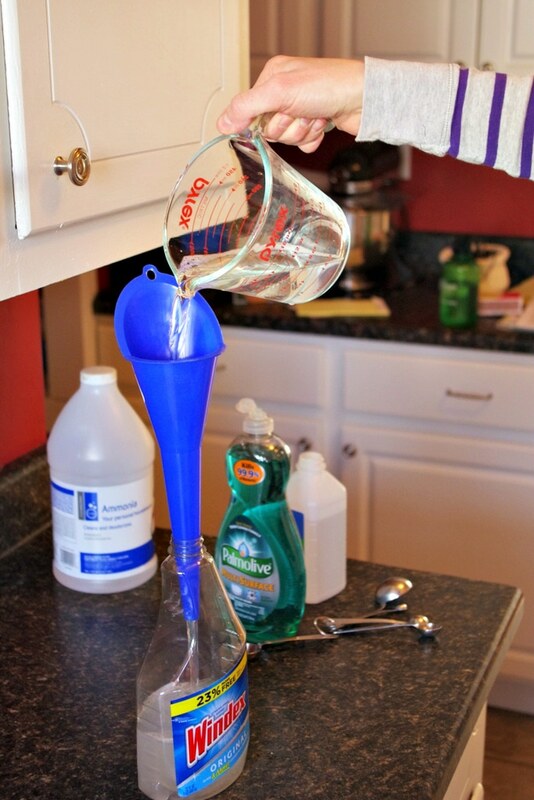 Pour this soapy ammonia solution into your spray bottle using the funnel. Now it’s time to add the alcohol. I’m using 91% isopropyl alcohol, but a smaller percentage shouldn’t make a difference. 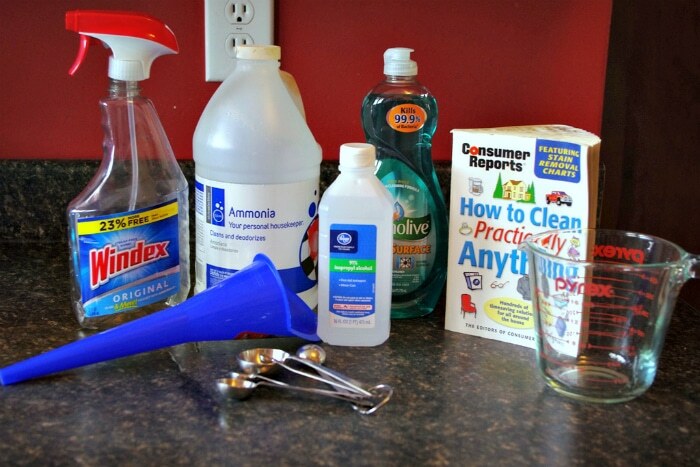 Measure out 1/2 cup and then add it to the soapy ammonia in the spray bottle. Finally, add lots of water! Window and glass cleaners are made with mostly water. Measure out 3 1/3 cups water and add it to the bottle. There is still room for more at the top of my bottle, so if you are using a 26 oz, nearly all of it will fit. Screw on the spray top, give it a shake, and do a “just learned how to make glass cleaner” dance! I tested the homemade solution in our upstairs bathroom. Using painters tape, I portioned out 3 sections on our dirty mirror. The left section was the control, the middle section was for the homemade Windex and the right section was for store bought Windex since I had some leftover. With ANY cleaning solution, always spray it onto your rag or towel and NOT on the surface itself. 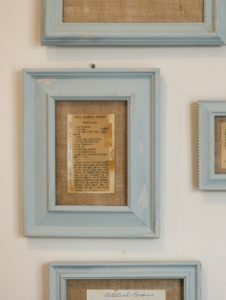 This prevents dripping into the edges of the glass or within the wood of the frame, which can cause erosion. If you have any doubts as to whether you can can use a glass cleaner that contains ammonia on certain replacement windows, contact your window manufacturer. Many of them have websites that will address this issue. Paper towels, microfiber towels and even old newspapers have been popular modes to clean windows. Use what you works best for you. I prefer microfiber cloths because they don’t leave little particles of paper and I can throw them in the wash.
Homemade Windex. 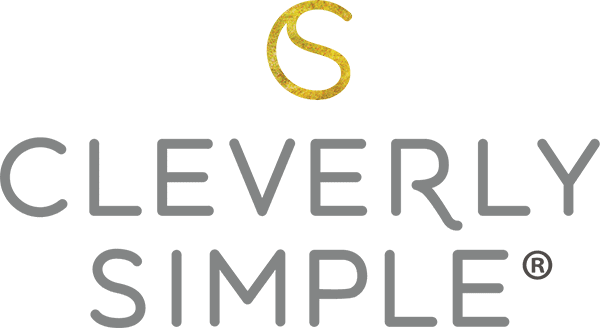 An easy way to add efficiency and quality to your home cleaning routine and at a fraction of the cost! This is the beginning of your recipe. My question is, teaspoons of what into a measuring cup or bowl? Sorry for the confusion! I just clarified the recipe to say “5 teaspoons of water into a liquid measuring cup” From there, you add the 2 teaspoons of ammonia and squirt of dish soap. This all make the soapy ammonia, which is 1 of 3 parts to the cleaner.